All Grain American Amber Ale homebrew recipe. 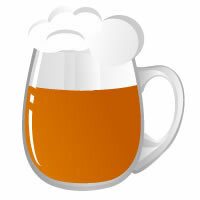 This homebrew recipe uses the following ingredients: Pilsner - DE, Vienna - US, Munich - UK, Aromatic Malt - UK , Caramel/Crystal 20 - US, Carapils - Dextrine Malt - US, Caramel/Crystal 40 - US, Tettnang Hops, Fermentis Safale S-04 Homebrew Yeast. Mash at 68C to 70C 60minutes. Can use S-23 yeast. Ferment at 12C for 10days. 18C for 3 days then reduce by 4C per day until 4C. lager at 4C for 3 weeks in keg or bottle.